As Ohio Stadium has grown, one thing has never changed: its horseshoe shape. The Ohio State stadium's distinctive shape is central to its history. Ohio State maintains the horseshoe in everything it does. The horseshoe is history. The horseshoe is home. The horseshoe is Ohio Stadium. 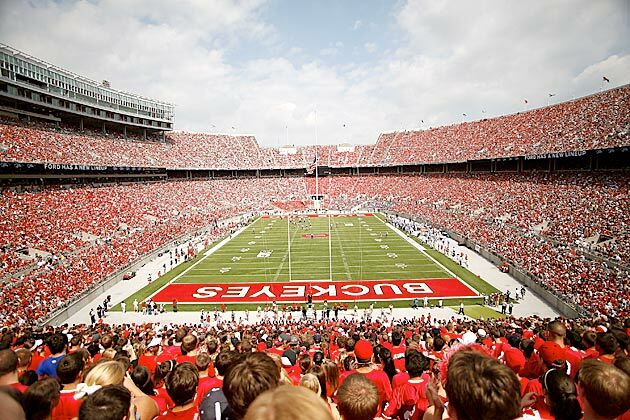 With latest addition prior to this season bumping Ohio Stadium to 104,944 seats, the 'Shoe, as the stadium is known, is now the fourth largest on-campus stadium in the nation. Even today, building a new stadium at 66,210 seats would prove a major undertaking. Ohio State did it in 1922, raising Ohio Stadium through a statewide campaign to bring in the money. The Howard Dwight Smith-designed structure became the nation’s first concrete double-deck stadium. He studied stadiums the world over and opted for the horseshoe shape so the curve ensured the crowd always faced the field. Covering 14.5 acres, Ohio Stadium easily improved upon the 20,000-seat Ohio Field in use by the successful Chic Harley-led teams. Tucked along the banks of the Olentangy River, Ohio Stadium is more than concrete double decking. The four towers provide architectural significance, and Smith designed in a touch of elegance with the rotunda. Following studies of the Pantheon in Rome, Smith brought the dome motif to Columbus, Ohio, with Ohio Stadium’s half-dome entry, complete with terra cotta tile-covered ceilings. While the horseshoe hasn’t changed, it has grown. Original years featured a track circling the football field. The track was moved across the river and a new lower section was added to the original bowl to bring seats closer to the field by 40 feet on each side. Patko says even the renovation matches up, with arches matching throughout the venue. A major 2001 upgrade to the venue, which is listed on the National Register of Historical Places, brought the stadium completely up to present-day codes while boosting capacity over the 100,000 mark for the first time. Ohio State added restrooms, reconditioned concrete, redid locker rooms, added concessions, added portions to the upper deck, built a brand-new press box and added 81 luxury suites. The 2014 remodel focused on the south stands, an area that doesn’t actually touch the horseshoe. The addition of 2,600 seats brings that section to about 19,600 seats, with the rest of the capacity inside the horseshoe. Along with the new seats, Ohio State upgraded the tunnels for the players, especially the Buckeyes’ tunnel, which gained graphics, TVs to show in-stadium images, a sound system, a lighted block “O” and a complete rubberized surface so the entire team can run out with more space. Patko says the school worked with the Ohio Historical Society to ensure that they didn’t touch the ends of the horseshoe. Because, at Ohio State, everything revolves around the 'shoe.